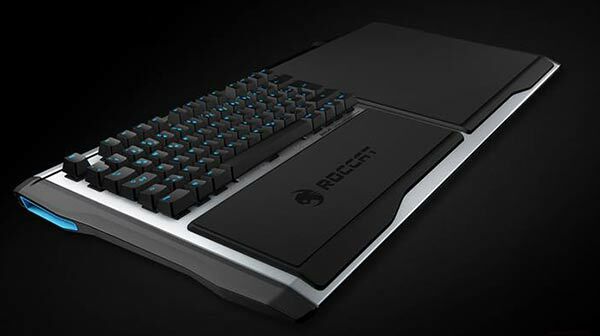 ROCCAT, the Hamburg-based PC gaming peripherals maker, has introduced a "revolutionary" new PC gaming accessory at the E3 show this year. The firm has spent "hundreds of hours of conceptualization, design refinement and testing," to create a solution for PC gamers in a bid to reclaim the sofa, the comfort of your living room. No longer will PC gamers be confined to their desktop or laptop study area, with the SOVA they will be able to "own the couch," ROCCAT told HEXUS in an email. René Korte, ROCCAT founder and CEO, announced the new PC gaming peripheral, "Streaming your PC games to a living room television has always meant sacrifice, particularly with wireless devices not manufactured for competitive players. We wanted to create a new instrument, a wireless keyboard and mousepad combo free of heavy latency, made with premium materials with a level of durability players can feel, that allows for hours of interruption free gameplay from the comfort of the couch. With the ROCCAT Sova, we are confident we have struck this balance with amazing accuracy," he said. ROCCAT has sought to make the SOVA much "more than a wireless keyboard and mousepad for your lap". It also supports smartphone use and other gaming accessories. As the unit has a built in USB port in its wireless chassis a gamer will be able to bring along his/her favourite gaming mouse. The SOVA will work with SteamOS, Android, Windows and Mac, we are told. As for availability ROCCAT is "still absorbing feedback from consumers and press to craft the final, optimal SOVA iteration". So it looks like it will be a few months until the final product is ready and we get out first indications about the price of this peripheral. Do HEXUS readers have any ideas about how to improve the SOVA? How is the key rollover? With a mouse added and all that, does it use 2 usb ports in the PC? What color MX switches? (Please add an option for black switches). Good idea, but it will be too much money for the market its aimed at. I guess that as Steamboxes are being sold with Windows due to controller delays, it will create a market for keyboards like this. 1: Soundcard so wired headphones can be plugged into it.